Above: Looking at a wing of the Grand Palace from the Upper Park. Below: The Grand Palace's North Facade. St. Petersburg is a city of palaces. In the historic city center, there seems to be one on every street. However, the czars and nobles also wanted places to escape to during the summer. Consequently, there are a number of palaces in what has over the years become the suburbs of St. Petersburg. One of these is the Peterhof Palace - - a world class palace that provides a very worthwhile experience for anyone interested in architecture, art, or history. 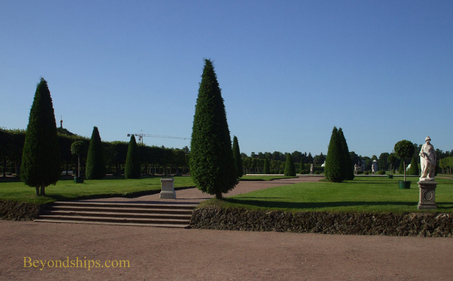 Moreover, the grounds of Peterhof are a visual delight on a summer's day. I went to Peterhof on a shore excursion organized by my cruise ship. It involved a coach ride of perhaps 45 minutes. (It is also possible to get to Peterhof by sea via hydrofoil). Along the way, the view from the coach consisted mostly of industrial plants and Soviet era apartment blocks - - not very scenic but interesting from a sociological standpoint. 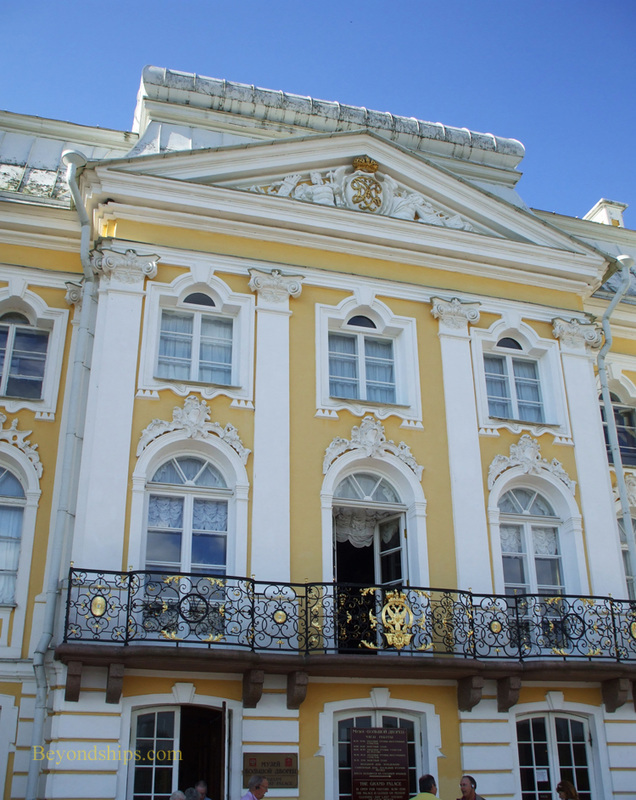 As we got closer to Peterhof, the residences became larger and our guide pointed out one palace where a Russian president had met with an American president. Peterhof dates back to the early days of St. Petersburg. In the first years of the 18th century, Czar Peter the Great was in the process of not only building his new city of St. Petersburg but also a base for his new navy at Kronstadt. 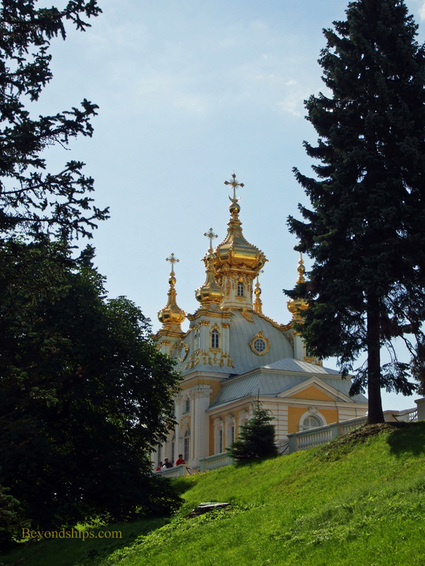 In traveling between the two projects, he discovered the place where Peterhof now stands and built a small wooden retreat. However, Peter soon began to develop new ideas for this location which he noted in his journals. In 1710, work began to transform his ideas into an official residence. This work was renewed with increased vigor after Peter returned from a trip to France in 1717, where he was impressed by the palaces and fountains at Versailles. He now wanted to create a Russian version of Versailles to impress both foreign visitors and his own nobles. To assist in this effort, Peter brought in the French architect Jean-Baptiste Alexandre Le Blond as well as numerous French and Italian artists and craftsmen. In order to create the fountains that he envisioned, he had thousands of soldiers work on channeling water from 24 km away. After Peter's death in 1725, Peterhof lay almost abandoned until his daughter Empress Elizabeth came to the throne in 1740. She decided to make the palace even grander and engaged the architect Bartolomeo Rastrelli. Although subsequent rulers made additions and alterations, the Grand Palace that we see today is largely Rastrelli's work. World War II was devastating for Peterhof. It lay within the territory captured by the Nazis. 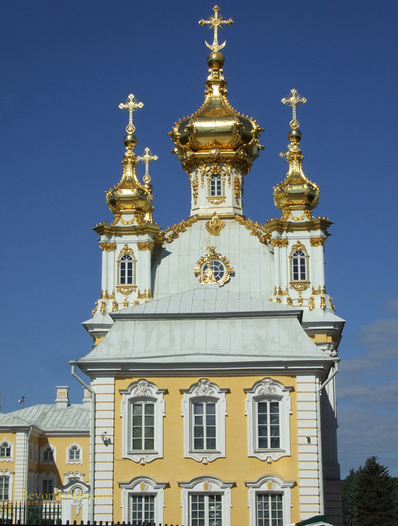 Although the staff were able to evacuate some of the treasures and hide others before Peterhof was taken, much was looted or destroyed by the invaders. 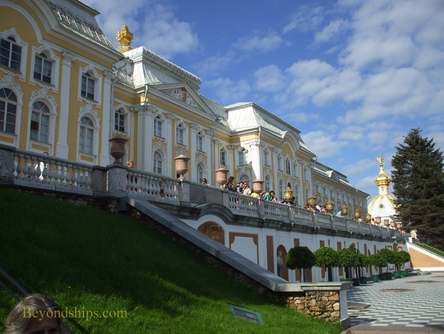 After the war, using photographs and original plans, Peterhof was superbly restored. Peterhof can be divided broadly into three areas. The Grand Palace sits atop a ridge approximately 100 meters from the Bay of Finland. Between the Bay and the Palace are is the Lower Park. On the opposite side of the Palace is the Upper Park. The Grand Palace itself is the third area. To get to the entrance to the Grand Palace, our tour group walked along a path that ran along the edge of the Upper Park. Originally, the Upper Park was a working garden. 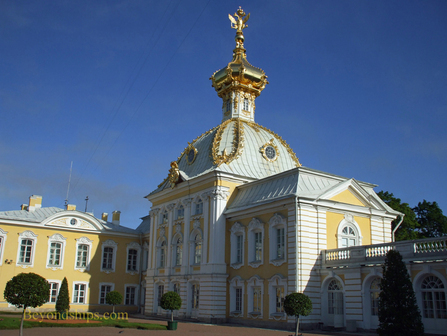 Its acres were used to grow vegetables and its ponds used to supply fish for the czar's table. However, in the 1740s, the area was re-designed as a European formal garden including flower beds, mirrored ponds and gazebos. That is the way the area looks today. The Grand Palace is a long relatively narrow structure done in a late Baroque almost Neoclassical style. 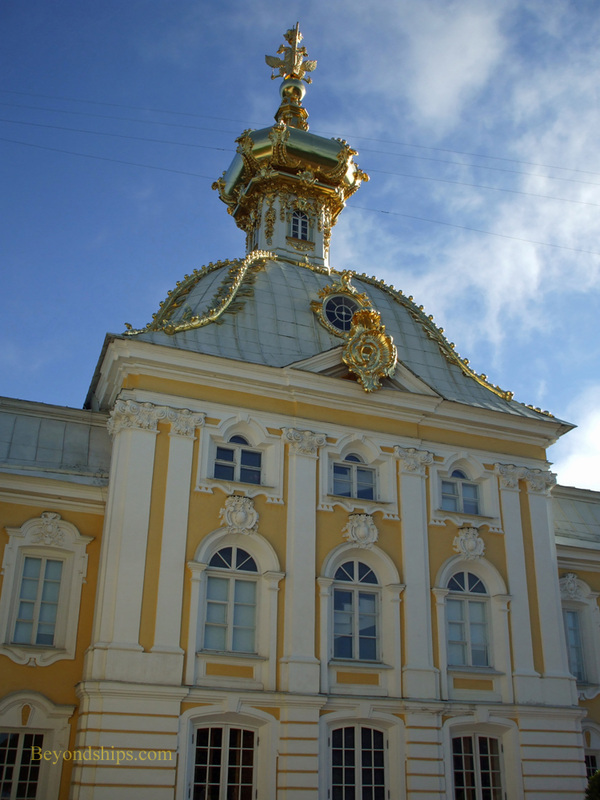 When Rastrelli re-designed the palace, he retained Peter the Great's original house but added wings with gilded copulas that shine in the sun. This contrasts nicely with the pale buff and white colors that predominate on the building's exterior. While the building is indisputably grand, it is not overly ornate in its exterior decoration. This makes it all the more impressive.